These instructions show you how to move Parts Tracker from one computer to another. Specifically, this means moving the file that holds all your Parts Tracker data to a new computer, and installing Parts Tracker to run on the new computer. Download and install Parts Tracker on the new computer. Note: the file name might end with “.mdb” depending on your computer settings. This is fine. The important part of the name is “PartsTrackerData4_0”. Copy the PartsTrackerData4_0 file to the other computer. There are various ways to do this. 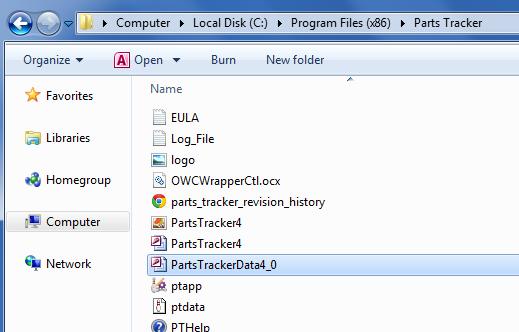 Note that the data file is quite large (depending on how long you’ve been using Parts Tracker). The best way is to use a removable storage device – e.g. a USB thumbdrive or external hard drive, or if you have an internal computer network, you can transfer the file between computers directly. Using the internet (email, Google Drive, Dropbox, etc) is also possible but check the file size first as it may exceed the limits for these services. Simply overwrite the file that is already there by copying the file from the removable storage or network and pasting it in the folder on the new computer. If done correctly, it will warn you that you are replacing a file. Make sure you choose the “Copy and Replace” option in Windows 7/8, or Confirm to Replace File in Windows XP. Start Parts Tracker on the new computer. If you computer is connected to the Internet, it will register automatically if you have copied the data file correctly. You will be taken to the main menu window. Skip this step if Parts Tracker started successfully in the previous step (with a message saying “Your registration has been updated”). Check that your details are correct in this window. If they are not correct (or blank), it means the data file has not been copied correctly. Repeat the previous steps. Note that a common mistake is to copy “PartsTracker4” instead of “PartsTrackerData4_0”. If you have done this, Parts Tracker won’t start. Just reinstall it to fix this. 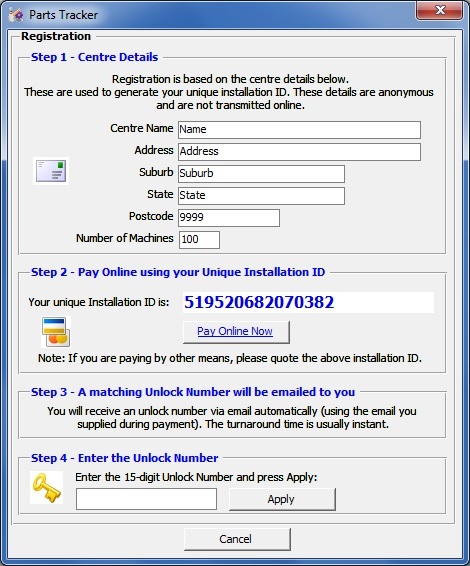 If you details are correct, copy and paste the blue installation ID into an email and send to Parts Tracker Support and you will receive a new unlock number for this computer. This may take up to 24 hours. You can use Parts Tracker in the meantime, however some functions are disabled in the unregistered mode. Also, when you close Parts Tracker the new Installation ID number will be retained (you don’t have to keep it open). When you get your unlock number, enter it in the Registration window to unlock Parts Tracker.